Book My Event Movie Reviews: Give an eloquent Sufi musical treat to your ears with Wadali Brothers! Give an eloquent Sufi musical treat to your ears with Wadali Brothers! In today’s busy world where everyone is running after something or the other, chasing one goal after another, the pursuit for happiness and satisfaction seems is a distant reality. But if there is one thing that can give you breathing space by bringing a standstill is soul-stirring music. A good music is the universal language that everyone understands and appreciates. And if that music comes from legends like Wadali Brothers – Puranchand Wadali and Pyarelal Wadali, one can find an escape to all the wordily, necessary and unnecessary stress. What else can define words like these? Wadali Brothers are one of the most acclaimed and illustrious Sufi Singers who have weaved enchantment with their bucolic, countryside and rustic charm. An accidental discovery by an executive from All India Radio (AIR) gave them a singing platform and musical gift to millions of their listeners. Since then, there is no looking back for this dazzling duo. They have created magic in different forms of music like gurbani, ghazal, kafi and bhajan. Bollywood also could not escape from their mystic music. Pinjar, Tanu Weds Manu, Mausam as well as Coke Studio have been blessed with their expressive and eloquent music. Together, Wadali Brothers will create magic on 26th August 2017 at Siri Fort Auditorium, August Kranti Marg, New Delhi, from 7 PM onwards with words that will touch your heart, voice that will move your heart and music that will melt your heart and will give you an evening that will live in your hearts- long after it is over. 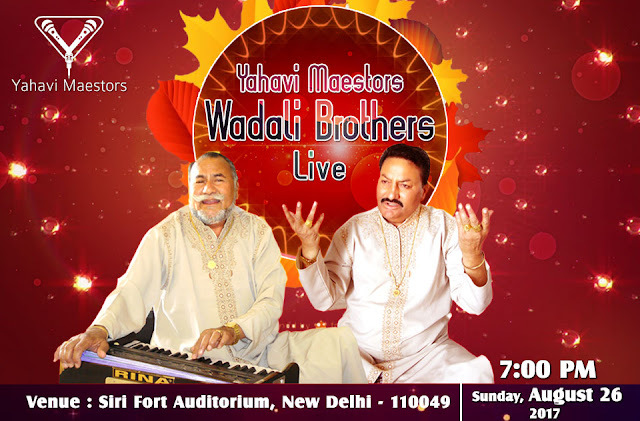 You can book tickets online here - https://goo.gl/WQL3RG and relish a charming evening with beautiful and soulful music from Wadali Brothers.